I have better judgment than she does, there's no question about that. I also have a much better temperament than she has, you know? I have a much better ... She spent, let me tell you. She spent hundreds of millions of dollars on an advertising, you know, they get Madison Avenue into a room — oh, temperament, let's go after. I think my strongest asset, maybe by far is my temperament. I have a winning temperament. I know how to win. She does not have a — Wait [...] the other day, behind the blue screen, I don't know who you were talking to, Secretary Clinton, but you was [sic] totally of control. I said, there's a person with a temperament who's got a problem. Never mind the fact that the discussion of Clinton's "temperament" was, in this moment, a non sequitur — it was also deeply rooted in sexism. The construct of how a woman "should" behave both in and out of politics is often a lose-lose situation: if a woman is assertive, she is unlikeable; but if a woman is too warm, she is weak. Even if we don't consciously acknowledge these biases, we unconsciously do — the narrative of a man yelling in the workplace, for instance, ends much differently for a woman who does the same thing. The man is frustrated and entitled to his anger, whereas a woman is unhinged and throwing a tantrum. This double-edged sword applies to most situations women find themselves in, but never is it more glaring than when a leadership role puts their behavior in the spotlight. Throughout this election, Clinton has found herself subject to these judgments the same way she always has. But Trump's use of the word "temperament" adds a much subtler, more insidious level of sexism to this narrative, whether he meant it to or not. Stop Sexist Remarks refers to this tactic as "The Temperament Trap." To further illustrate how the word has been held against women in power in the past, Stop Sexist Remarks examined an incident in 2009 in which Senator Lindsey Graham of South Carolina disapproved of Supreme Court Justice Sonia Sotomayor's appointment to the Supreme Court, saying by way of explanation, "There’s a character problem; there’s a temperament problem." The New York Times also endured some heat from Twitter users for its 2013 profile of Speaker of the New York City Council Christie Quinn's temper, titled, "In Private, Quinn Displays A Volatile Side." Critics of the article pointed out that not only did her private temper have nothing to do with her job, but that the article was written by two men. But the absurdity of women's "temperaments" that have been dragged into the public arena — Clinton's, Sotomayor's, and Quinn's alike — really boils down to one question: Would we be questioning any of the behaviors that make up their "temperaments" if they were men? 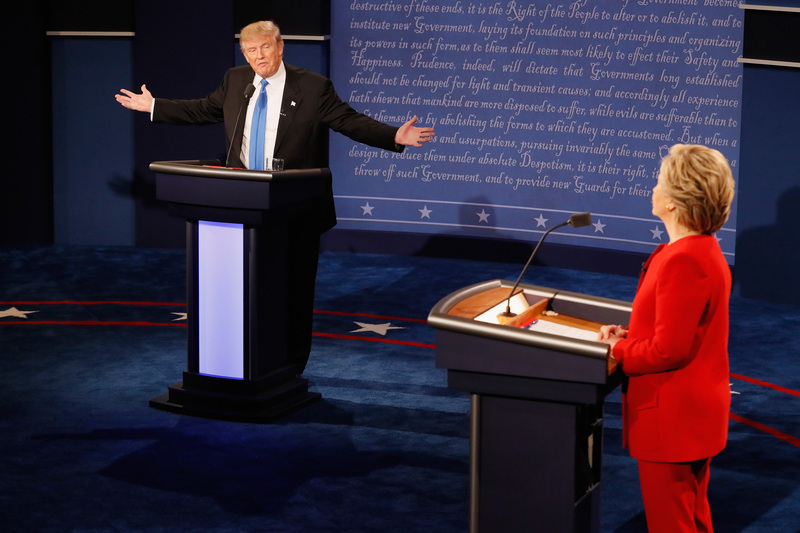 Trump's comments about Clinton's temperament on Monday night are all the more upsetting when you consider the very cause of her self-professed "walled off" nature. In a poignant Humans Of New York post, Clinton explained that her steely nature wasn't an accident, but rather a survival tactic. Harassed by men throughout her academic and professional career, she shared, "I know that I can be perceived as aloof or cold or unemotional. But I had to learn as a young woman to control my emotions. And that’s a hard path to walk. Because you need to protect yourself, you need to keep steady, but at the same time you don’t want to seem ‘walled off.’"
Clinton addressed here the dual nature of sexism that affects not just her, but every woman — damned if you do, damned if you don't. Damned if you let them see you cry, and damned if you're strong. "Women are seen through a different lens. It’s not bad. It’s just a fact. It’s really quite funny," Clinton said to Humans of New York. "I’ll go to these events and there will be men speaking before me, and they’ll be pounding the message, and screaming about how we need to win the election. And people will love it. And I want to do the same thing. Because I care about this stuff. But I’ve learned that I can’t be quite so passionate in my presentation. I love to wave my arms, but apparently that’s a little bit scary to people. And I can’t yell too much. It comes across as ‘too loud’ or ‘too shrill’ or ‘too this’ or ‘too that.’"
And that line between "too this" and "too that" is one that Clinton and all women in positions of power are forced to straddle every day. If it is Trump scrutinizing it today, it will be someone else tomorrow — and rest assured, as innocent as the word "temperament" seems, it remains one of the most damaging weapons in their arsenal.